Juventus nearly made the perfect start to Tuesday’s last-16 second leg against Atletico Madrid. IT DID NOT take long for controversy to take hold in Tuesday’s match between Juventus and Atletico Madrid. Atletico entered the second leg of the Champions League last-16 encounter holding a 2-0 advantage, putting the onus on Juventus to attack. 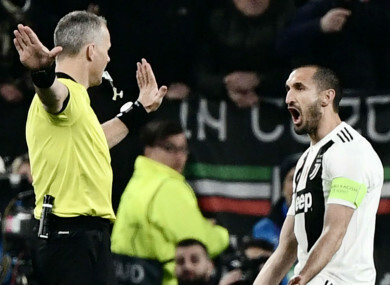 The home side did just that, and they thought they’d taken an early lead just three minutes in when Giorgio Chiellini slammed home off a corner kick after a scramble in front of the net. However, Dutch referee Bjoern Kuipers judged that Cristiano Ronaldo had fouled Atletico goalkeeper Jan Oblak in the build-up, and waved off the goal. After a brief VAR review with Kuipers staying on the field, the decision was upheld and Atletico could breathe a sigh of relief. Naturally, there was plenty of reaction on social media to the incident, with fans divided as to whether Ronaldo had committed an infraction. But was it the right call? Let us know your thoughts in the comments section below. Email “Watch: VAR review splits opinion after Ronaldo infraction”. Feedback on “Watch: VAR review splits opinion after Ronaldo infraction”.